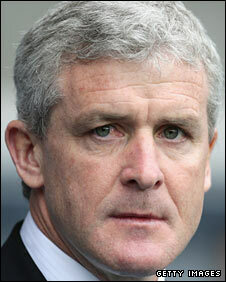 Mark Hughes has been appointed as the new manager of Manchester City after signing a three-year contract. Hughes held talks with the City hierarchy in London on Tuesday evening and agreed to leave Blackburn after a second round of talks on Wednesday. City's only concern was a late move by Chelsea, but BBC Sport believes Hughes was never a serious contender. And City owner Thaksin Shinawatra has now landed his top target after Sven-Goran Eriksson's departure. Shinawatra said: "He's an outstanding manager who has achieved many things with Blackburn. "Mark was always the first choice of our new executive chairman, Garry Cook. Together they will make a great team. They will both prove to be excellent acquisitions, I'm sure." Thaksin also sent a message to City fans still angry at the sacking of Eriksson, saying: "I want this club to advance much, much faster. Sven is a good football general, but we need more. "We need a culture of discipline at our club. I want strong leadership from the manager, motivation from young men and I want payers who can cope with that. "These are exciting times for Manchester City and I hope the supporters can understand that I share their goals. Cook, who was appointed as executive chairman last month, said: "In our view Mark is the brightest young manager in the game and he was our number one target for the manager's job. "He made it clear to us from the moment we met that he shared our vision and ambition to make Manchester City one of the top sides in the country. "The club intends to invest in new players as well as securing the long term services of key members of the current first team squad. "Mark has already identified some of the players and backroom staff that he wants to see here at City, and we will begin the process of recruiting them immediately." The Welshman has guided Rovers into Europe twice, but recently indicated his long-term ambitions might not be satisfied at Ewood Park. Despite the volatile regime that saw Eriksson leave City, Hughes has apparently given up the stability of Blackburn because of the bigger stature of the Eastlands club. And having always worked within a limited budget at Blackburn, it is likely he will now be backed with major transfer funds. Another temptation for Hughes was the lure of European football, with City in the Uefa Cup, and the attraction of managing a team that plays in front of 40,000-plus crowds on a regular basis. Former Wales boss Hughes has impressed during his three-and-a-half year spell at Ewood Park, guiding Rovers to seventh in the Premier League last season. He also led the club to its first FA Cup semi-final in 40 years in 2004 and another in 2007. Blackburn chairman John Williams paid tribute to Hughes. He said: "We have enjoyed a first-class, mutually beneficial relationship with Mark. "He leaves the club in a strong position with three consecutive top 10 finishes and an excellent squad of players. "In turn, we have helped Mark to establish himself as one of the most sought-after young British managers in the business, having previously had no club management experience. "We wish him well. We would have liked him to stay on, but he made it clear he wanted a fresh challenge." Earlier this year, the former Manchester United and Chelsea striker was one of the front-runners to succeed Sam Allardyce as Newcastle manager before Kevin Keegan took the job.